Clermont Garden Club donated $520 to Lake County School District’s Families in Transition Program (FIT). FIT falls under the McKinney- Vento Act, established to assist homeless children and youth enrolling , attending, and succeeding in school. Under this legislation, homeless youths are guaranteed the same educational services that all students are provided in order to meet challenging academic standards. The act also ensures that homeless youths be educated in their neighborhood school or in the attendance area where the family or youth is currently residing. 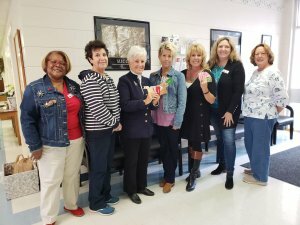 Members of Clermont Garden Club presented $520 in gift cards to Lake County School District’s Families in Transition Program liaisons, Kristan McCall and Kathy Entler, Wednesday, January 16, 2019. Pictured are, (left to right), Gwen Carter, Margaret IIIer, Tina Worrell, Kathy Entler, Kristan McCall, Debra Smidt, and Cindy Simon.